To build up anticipation for Bu Bu Jing Xin’s <步步驚心> modern sequel, Bu Bu Jing Qing <步步驚情> released an exciting dramatic trailer earlier. 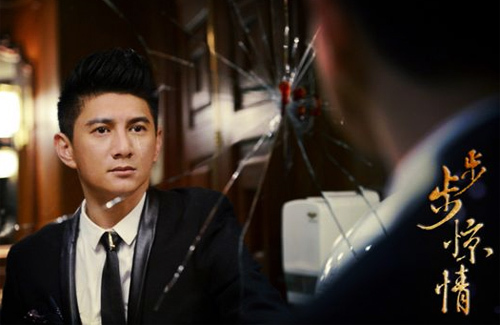 This was quickly followed by the release of various music videos, emphasizing on Cecilia Liu’s (劉詩詩) romantic entanglements with Nicky Wu (吳奇隆) and Sun Yizhou (孫藝洲) and in the sequel. When time-travelling hit Bu Bu Jing Qing was released in 2011, viewers were saddened by the tragic conclusion between lovers Cecilia and Nicky. Producer Karen Tsai (蔡艺侬) promised to follow up with a sequel featuring original cast members. However Kevin Cheng (鄭嘉穎) and Lin Gengxin (林更新) were unable to return due to scheduling conflicts and management conflicts respectively. Chinese Entertainment Shanghai proceeded with the addition of new cast members Sun Yizhou and Jiang Jingfu (蔣勁夫) while following up on Nicky and Cecilia’s romance. After Cecilia’s character time travels to modern times, she has hazy memories of her love relationship with the Yongzheng Emperor (Nicky Wu). She sees a mysterious man in her dreams, but is unable to identify him and her relation to him. Trying to sort out the mystery, Cecilia is confronted with a model who looks exactly like her and finds herself unwittingly involved in a power struggle between Nicky and Sun Yizhou as they wrestle corporate control from Damian Lau (劉松仁). Annie and Cecilia portray a pair of sisters who lead very different lives, but both fall in love with Sun Yizhou. Adding to the earlier music video releases for “Not Up To Us” <身不由己> and “Step by Step” <步步>, the latest addition is “Dust” <塵埃>, which features the voice of Jia Jia (家家) and stars Cecilia Liu, Sun Yizhou, and Annie Liu (劉心悠). The five-minute video conjures feelings of sweetness and sadness. After anticipating for more than two years, fans finally are able to see exciting footage from Bu Bu Jing Qing and should not have to wait much longer its official broadcast. Trailer has Nicky’s real voice! Wahh!!! Nicky looks so perfect in that picture!!!! I really can care less about Nicky Wu and didn’t bother reading this article. I also don’t like Donnie Yen or any mainland actors. So….. you’re just here for attention. LOL you don’t care, but you had the time to click on the article and actually comment to everyone to inform that you don’t care and didn’t read the article. Makes a lot of sense. exactly my thoughts. may he/she cares about Nicky than they think they don’t. Thank you. I was thinking the same about Munkmui. If he/she doesn’t care – why bother to come here and make comment? Well said John! Those were my exact thoughts. Well said Puff! I do not understand why people love to spend so much time on people that they hate. They must have nothing better to do. Sorry, I do not have the answers to that. I know that for Canada, it may be aired on talentvision, but I’m not sure, but it should be uploaded onto youtube. Hopefully, some nice person will upload it in HD. Just can’t wait to see it!!! yeah, I can’t some of those silly ‘fashionable’ hairdos on the guys. What if it is the crew that did his hair for him so he had no choice? But if he likes his hair like then I do not see what the big deal is. Dissing costumes, stories, etc are made on various threads here; why get bothered over a comment about a pouffy hairstyle that just isn’t flattering on him or any guy? It ain’t the director, Nicky had that hair in real life. He think he looked so cool with all dat hair, trying to look and act younger than his age. Moronic. Who doesn’t want to look younger which is why they go through botox and all to get rid of the wrinkles and stuff. He already looks young for his age. The silly hairdo detracts from his handsome appearance. If you look at his hairstyles the last couple years – they do reflect from the roles he played in the dramas (like Advancing Towards Victory = 向着胜利前进, Severe Winter = 寒冬 and Advancing Towards Happiness = 向着幸福前进). Can’t wait to watch it too!!!!!! i never liked BBJQ, but this one looks interesting! I think nfc meant to say BBJX. Agree. I don’t like ’em. But what we get is what we get and we don’t throw a fit. LOL. Personally I like all the theme songs. Especially “身不由己”(Not Up to Us). The May Day’s song is too short (only 1:42 minutes). I hope they release a soundtrack for this series. That is only a portion of the Mayday song. I liked all of the songs. You are welcome and usually when a song is played for an opening or ending song for the actual series, it is usually just a portion of the song since the songs are usually too long for the opening and ending sequences. Snoooooze :s it don’t feel exciting at all :/ pass lol! It’s the tragic ending of Bu Bu Jing Xin, not Bu Bu Jing Qing. Didn’t we see that trailer before? I thought it was going to be a new one. LOL. March 9th. That’s soon! It better be good! All this waiting and anticipating.